What is the purpose of this intro program? 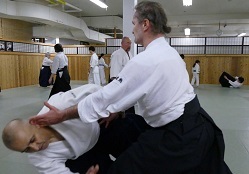 The program is intended as a first introduction to Aikido for those who are curious about this martial art, and is designed to show various aspects: from basic footwork movements to basic techniques to weapons practice and to dealing with multiple attackers. How is it different from a "normal" beginners program? In a "normal" beginners program, it may take many months for new beginners to see advanced aspects of Aikido, whereas our special introductory program will give the beginners some flavour of what Aikido has to offer quite early on. It goes without saying, of course, that to become actually good at Aikido will take years of dedicated practice! What can students expect to learn from the intro program? They will learn some basic footwork and ukemi (a safe way of falling down), and some basic Aikido techniques. They will get to practice with our more advanced dojo members and learn from them. The students will certainly have a much better idea of what Aikido is after being exposed to this program, and hopefully will want to continue on their Aikido journey for many years after this first experience. What is next after this program? Once the two-week intro program is over, we will be continuing with our standard beginners classes. The students who wish to continue practicing Aikido are welcome to join our dojo, and start attending our beginners program. Once the beginners are proficient enough in their ukemi and with basic foot work, they are encouraged to start attending our regular classes, taught by our Chief Instructor, Ishu Ishiyama Shihan, 7th dan. You can continue attending both beginners and regular classes for as long as you wish! Who is the instructor for the intro program? 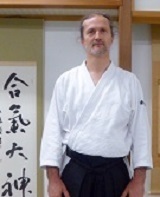 The main instructor for the intro program (and for the beginners program thereafter) is Valentine Kabanets, 3rd dan, with over 10 years of Aikido practice (in Canada, Japan, USA, and UK). He's been practicing Aikido under Ishiyama Shihan's guidance since 2005, and has also been influenced by other Aikido teachers, in particular, by Tada Shihan, Osawa Shihan, and Tissier Shihan. 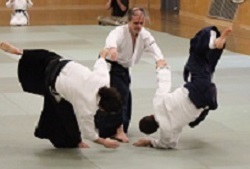 What happens in an Aikido class? First, we line up and bow in, then we do Aikido warm-ups, and finally start practicing Aikido techniques as demonstrated by the instructor. It is a cooperative practice with a partner, where you take turns being a nage (performing a technique) and an uke (receiving a technique). At the end of the class, we again line up and bow out. We follow the Japanese etiquette about bowing and are using Japanese terms. It may take you some time getting used to it, but we will be there to help! Come to the dojo on the first day of classes (or at a later day, if you can't make it to the first class), wearing loose comfortable clothes (you don't need to buy keiko gi right away, just practice for a few classes and see if you intend to continue). Please arrive at least 15 minutes before the class starts, to allow time for introductions and some paperwork. Most importantly, be open-minded and willing to learn something new. Our instructor and students will make sure you enjoy your first encounter with Aikido!